Eat. Mindfully. is about the love and appreciation of ourselves, our bodies and the foods we put into them. It's about breaking away from dieting and obsessive thoughts about which foods are 'fattening' and learning to rediscover the joy of eating. 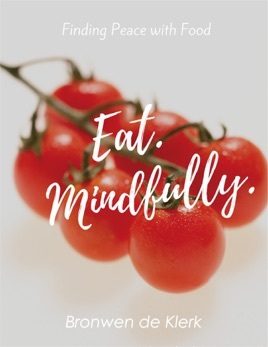 Eating without overeating, eating without guilt, eating mindfully. After years of dieting, Bronwen developed an eating disorder. Through the guidance of many teachers and much soul searching, she found peace with food, eating, her body and herself. She lost more than 20 kilograms (3 stone) and has kept it off for more than 20 years now. Bronwen weaves her personal story throughout the book to illustrate her healing journey and to help guide you to healing your own life. Bronwen de Klerk is a yoga and mindful eating teacher. She gives talks and workshops internationally and online.